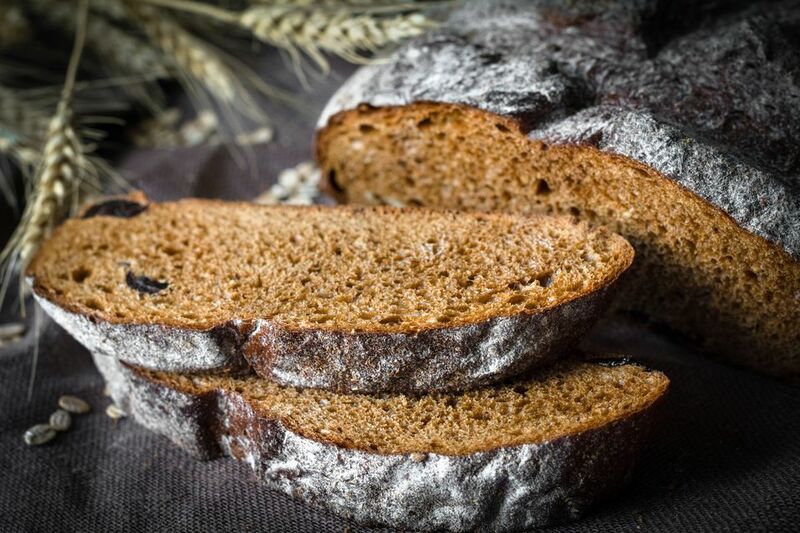 Russian sourdough dark rye is a hearty bread meant to accompany a main-meal soup and, maybe, some chunks of pickled herring. Or try it in a grilled cheese sandwich with Eastern European flair! This bread takes some planning. The rye sour needs to be made 4 to 5 days ahead of baking day but, oh, it is so worth it. Just remember, rye doughs tend to be sticky, so don't keep adding additional flour to eliminate the stickiness. This is the way it should be. And here are Leftover Rye Bread Recipes. SHORTCUT: Purchase a live sourdough starter. Let the dough rest, covered, for 5 minutes and then knead another 5 minutes. Lightly coat a large bowl with cooking spray and place the dough in it, turning once to oil the top. Cover and let rise until doubled. Punch down dough and divide in half. Shape each into a round or oblong loaf and place on a parchment-lined baking sheet sprinkled with cornmeal. Cover and let rise until doubled. About 15 minutes before you want to bake, place a pan on the lowest rack of the oven for water to be added to create steam, and place another oven rack directly above it for the bread. Heat oven to 375 degrees. When ready to bake, slash the loaves with a lame bread-slashing tool or razor blade up to three times diagonally or once lengthwise and brush them with cold beaten egg whites. Pour 2 or 3 cups of water into the pan to create steam. Place loaves on the rack directly above. Bake 35-40 minutes or until an instant-read thermometer registers 195-200 degrees. Remove from oven and turn out of pans. Let cool completely on a wire rack. Rye bread has a gummy texture if eaten hot.